Vote Yes for School Bonds! Vote Yes for Steele Creek Children! 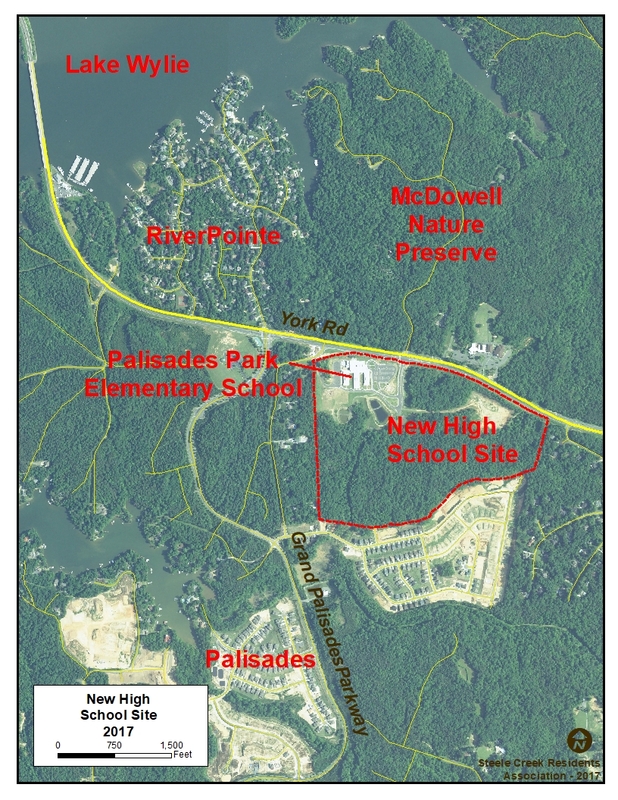 Southwest high school: A 125-classroom school to relieve Olympic High would be built on CMS property next to Palisades Park Elementary School on York Road. Opening is scheduled for 2022. Cost is $110 million. - Charlotte Observer, October 3, 2017. In the Capacity Utilization Chart for the 2016-2017 School Year, Olympic was listed with 147 classroom teachers in 102 building classrooms, which results in a Building Utilization of 144%, the second highest (behind South Mecklenburg) among CMS high schools. For the 2016-2017 school year, it had 34 mobile classrooms in service, first among CMS high schools. 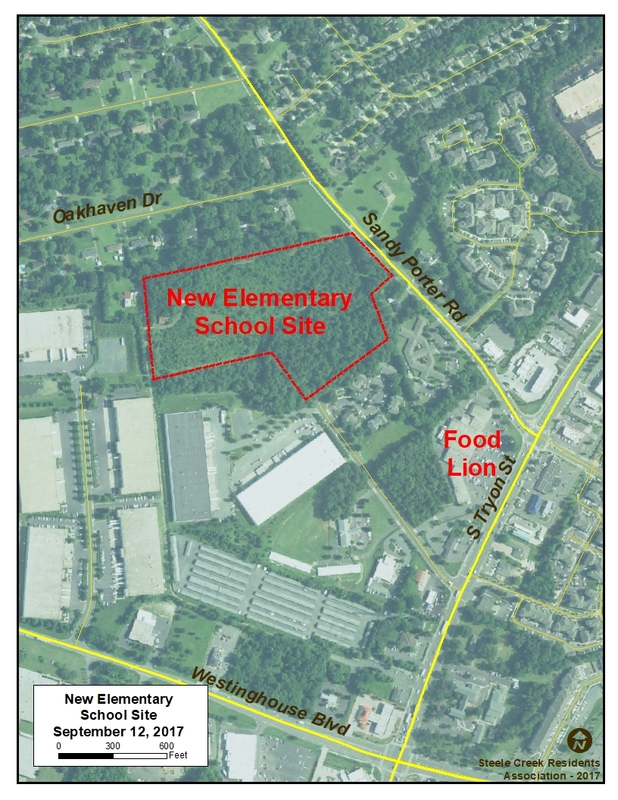 Southwest elementary school: A 45-classroom school would be built on land CMS recently agreed to buy off Sandy Porter Road. It will relieve Nations Ford, Sterling, and Steele Creek. Opening is scheduled for 2021. Cost is $30 million. - Charlotte Observer, October 3, 2017. The Board of Education approved the purchase of approximately 19.75 acres for this school on Sandy Porter Road at its September 12 meeting. The Capacity Utilization Chart for the 2016-2017 School Year lists Steele Creek Elementary School with 45 classroom teachers in 33 building classrooms, which results in a Building Utilization of 136%. It had 11 mobile classrooms in service. Olympic, Harding, Garinger and South Mecklenburg high schools: Buildings would be upgraded to create new career-tech classes, with the programs yet to be selected. Completion is scheduled for January 2023. Cost for all four is $10 million. - Charlotte Observer, October 3, 2017. Olympic High School opened in 1966 and has one of the oldest buildings among CMS high schools. 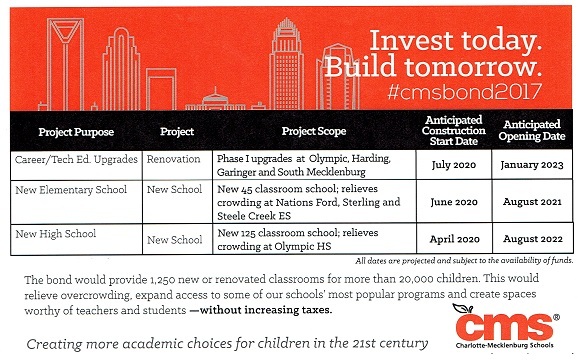 Olympic received funds from the 2007 (track, stadium, and roofing) and 2013 (classroom addition) School Bonds, but CMS needs to give continued attention to its aging facilities. Southwest and Kennedy Middle Schools also are over capacity. CMS owns land for a relief middle school on Steele Creek Road south of Hamilton Road, but that school will have to wait for another bond issue. According to Arthur Griffin, former chair of the Charlotte-Mecklenburg Board of Education and co-chair of the Vote Yes for Education Bonds Campaign, Mecklenburg County maintains its top bond rating because the community takes care of its citizens by regularly passing bonds to keep up with the needs of the community. CMS has identified $2.1 billion worth of capital needs, but is only including $922 million of those needs in the 2017 bond. Mecklenburg County is only willing to accept that much debt for this bond cycle. It includes 29 total projects, 17 new schools and 12 major renovations. "CMS is what it is because of forward thinking leaders," Griffin said. Some Mecklenburg County voters, especially in the northern part of the county, oppose the bonds because they believe they're not getting enough in this bond. They overlook the fact that the northern part of the county has received $375 worth of bond money from previous bonds. 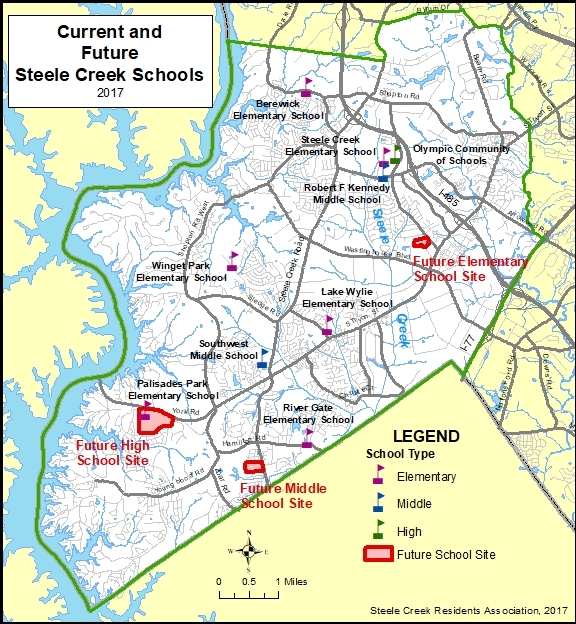 If they can't get what they want, they don't want any other areas to get anything, and overcrowding would continue in Steele Creek schools unabated. For more information, see Vote Yes for School Bonds! or the CMS Bond Information Homepage. The General Election is November 7. Early Voting starts at the Steele Creek Library on Saturday, October 28. For more information, see Mecklenburg County Board of Elections or City, School Board Offices and School Bonds are on November Ballot.